Ninja Intelli-Sense Kitchen System Review: Thorough with videos! Check it out on Best Buy click image below. Ninja Intelli-Sense Kitchen System Review! Ninja® Intelli-Sense™ Kitchen System with Auto-Spiralizer™ features one smart base that transforms into four high-performance appliances. While 12 chef-designed Smart Programs effortlessly create an endless array of delicious recipes. With Ninja’s Smart Vessel Recognition, program selection is easier than ever, so any time spent in the kitchen is as easy as Snap. Tap. Go. Wow! That was my 1st reaction to unboxing this system. I’ve worked with many home kitchen blending and mixing systems over the years. Subsequently this is clearly the best multi-function blender I’ve tested so far. This is a serious machine and a real workhorse with lots of power as well as the main functions that people will want and need. The only real drawback is the very loud motor. I was forced to use my new Sony noise-canceling headphones on the 1st go-round with this beast. This Ninja comes with a quick set-up guide. In addition to a nifty peel-off sticker that allowed me to familiarize myself with the touchscreen controls. It gave me working knowledge of screen before the touchscreen was illuminated. This Ninja also comes with a REAL instruction book! What a refreshing departure from what too many electronics and appliance manufacturers provide today. Which is typically only a mini-quick-start guide and a standard redirect to look online for full instructions. The package also includes an 82 page “Mealtime Streamlined” recipe book with 35 “quick and easy” recipes. While I often ignore such bonus materials, which are too often just lame stuffers and throwaways. In this booklet it contains some great inspirational ideas. It comes with full color photos, ingredients & food prep lists, complete cooking directions, and helpful tips. This literature comes with lots of practical applications for making great dishes. Including recipes that showcase each function of the Ninja and demonstrate its broad capabilities. This 4-in-1 system conceivably could free up a great deal of kitchen counter space by replacing 4 types of specialized blenders. It could replace the Magic Bullet personal smoothie blender, a traditional KitchenAid countertop pitcher blender, a Cuisinart food processor, and an OXO Good Grips hand-cranked veggie spiralizer. How so? Well, this Ninja comes with 4 interchangeable hi-performance appliances that attach to 1 powerful 1200W smart base. Its 4 plastic containers or ‘vessels’, as Ninja calls them, are easy to assemble and load onto the base unit. Each vessel is imprinted with helpful icons, measurement markings, and practical usage guides. The intuitive touchscreen base comes with 12 pre-set smart program buttons. Which menu of buttons is displayed is a function of which unique vessel is locked onto the base. A concept Ninja refers to as “Smart-Vessel Recognition”. Impressively, these chef-designed pre-set programs are precisely calibrated. Combining unique speed, power, and torque adjustments with a unique set of timed pulsing, pausing, and blending patterns. All of which is designed to help take the guesswork out of drink and meal making process. To give an example Ninja’s Smart-Vessel Recognition when you attach the Single-Serve Cup vessel 4 options are displayed. These 4 options are smoothie, Extract, Refresher, and Dressing. Drilling down, the Smoothie option will vary the speed and cycle of the blending thru repeated auto pauses that allow larger frozen fruit chunks to sink. This puts contents in range of the blades before it starts blending again. It also ensures that all the ingredients, regardless of shape, size, and temp (solid or liquid, frozen or not), are fully blended to the correct consistency. No chunks and no lumps! With the digital timer display, you can hit the button and walk away, knowing that you’ll still get the results you want. Or you can stay and watch the hands-free progress of the pre-set blending program as it counts down exactly how long it’ll be until your perfectly blended drink is ready. The program mentioned above is ideal for hard, leafy, or fibrous whole fruits or veggies. Extracting breaks down the cell walls of fibrous plant foods. Releasing the important vitamins and minerals contained within. While reducing beneficial fiber, pulp, seeds, and skins into a smooth texture, delivering food to your body in an easily digestible and absorbable form. The Refresher program mentioned above allows you to add natural veggie, fruit, and herb flavors to your water. The Dressing program mentioned above lets you create homemade salad dressings, marinades, and salsas, etc. Do not like automated programs? Of course! Do not prefer using the pre-programmed buttons? You can always manually override the presets and exercise hands-on control by using the Low, High, & ‘Pulse’ power button options. We make a lot of smoothies! So the extra-large 24oz single-serve cup is the perfect size for our blend-and-go smoothies after our morning run and workout. After blending, just flip over the inverted cup. Screw on the flip-top travel lid with drinking spout, and the cup now doubles as a handy double walled to go tumbler. This higher capacity trumps the Magic Bullet, which holds just 18oz. Thankfully, the 1200W Ninja motor is very powerful. In fact, the pro extractor blades can pulverize and liquify skins, seeds, and stems for extractions. Likewise, these blades can easily and quickly chop or crush the ice and frozen fruits & nuts that we keep in the freezer for our morning smoothies into finely cut ash. Oh, did I mention that it’s LOUD? By comparison, refreshers, ice pops, morning green shots, and iced coffees are just a walk in the park for the Ninja to blend. The large 72 oz pitcher with it’s built-in pour spout is an excellent design. This powerful system with it’s stacked blade design can make anything in large volumes. From smoothies to milkshakes! Frozen drinks, and anything from ice cream! Snow cones to sherbet and sorbet. The blade isn’t screwed on from the bottom like a standard blender. It’s simply inserted and removed from the top. This makes it so much easier when working with a thick concoction. You can reach in & pull out the blade to easily scoop out the mixture with a spatula. The Snow Cone program mentioned above is designed specifically to pulverize ice or frozen fruit into frozen fluff or mush creations like snow cones, granitas (semi-frozen Italian dessert), or slushies. This 64oz (8 cup) vessel comes with 2 interchangeable food processing disc blades, a chopping blade & a dough blade [for doughs (up to 2 lb), breads, and batters]. You can mix, chop, puree, or garnish most anything from savory to sweet. Pre-set options with this vessel include: Puree, Dough, Chop, and Dips. Again, the powerful motor makes quick work of meal prep here. I made homemade gluten-free pizza dough in a lot less time than it normally takes, and I made our gluten-free pancake batter in a flash. I also saved considerable time and effort making cauliflower “mashed potatoes”. The Dips program mentioned above is ideal for creating dishes like spinach or artichoke dips and sides with more texture like mashed potatoes and hummus. The auto-spiralizer is my favorite attachment. No more cranking out zucchini noodles by hand with a tabletop spiralizer! This unit includes both a spaghetti blade (red disc) & a fettuccine blade (green disc), and there are 3 other blades with color-coded discs available for separate purchase (angel hair: yellow, Pappardelle: orange, & ribbon: blue). If you’re into a low-carb lifestyle or just want to replace pastas with healthier options. You will love this! I have “noodled” several types of squash and made some sweet potato curly and shoestring fries. As well as hash browns. I’ve also noodled plenty of our weeknight garden salad fixings, including beets, carrots, and cucumbers. The included Collecting Bowl makes it easy to transport the noodles to a pan or bowl. My complaint is that the Collecting Bowl isn’t larger. I have to empty the bowl of noodles after almost every run-thru. Thankfully, the motor isn’t quite as loud with this particular function. The base comes with suction cup feet which effectively put the 1200W machine in lockdown mode. This prevents shifting, skidding, sliding and tipping while the unit is in operation. Yet it’s easy to reposition the base via the built-in release levers hidden in the left and right underside of the machine. These levers are where the user naturally places his hands anyway when moving the unit. This is yet more evidence of smart product engineering. The stainless steel rustproof blades, BPA-free Tritan plastic containers, and lids are all dishwasher safe. Top rack only for blade assemblies. Yay! It also comes with a unique cleaning brush. Which you’ll want to use otherwise your cleaning sponge will be torn to shreds by the sharp blade assemblies. The cord wrap is placed discreetly behind the base; so, the Ninja looks neat/tidy on your counter. Thankfully, the power cord is 2½ft long (30”)! This provides ample reach to multiple electrical outlets above the kitchen counters. Dimensions 17½”H x 10”W x 7”D. A Powerful 1200W motor gets even difficult jobs done quickly. Well Engineered and Designed! Secure fit with all vessels locking solidly onto base and lids locking securely onto vessels. Versatile and will arguably take the place of multiple specialized countertop appliances as an all-in-1 blender/processor. Easy to Use, intuitive, easy to operate, and easy to assemble or disassemble. Easy to Clean with dishwasher-safe parts. Noisy! 1200W of power is great, but the engineers need to design the next model with noise dampening. It is just too loud! Plastic Containers: Just as the cutting blades are rightly made of stainless steel, the containers should be made of glass. Glass is preferred for sanitary, cleaning, leaching, overall health and durability reasons, especially at this higher price point. So far, everything I’ve made with this Ninja has turned out great! Including several types of frozen fruit and fresh veggie smoothies, several types of fresh vegetable noodles for salads and stir-fry, cauliflower ‘mashed potatoes’, and sweet potato fries and hash browns. What a great wedding gift this would make for a young couple starting out. It would also make a great Christmas or birthday gift for the right family member. The chef-designed Smart Programs are precisely calibrated patterns of pulsing, pausing, and speed that create everything from fresh salsa and pizza dough to margaritas and ice cream—at the touch of a button. Smart Vessel Recognition automatically displays a unique menu of Smart Programs per vessel attached—and adjusts speed, power, and torque accordingly. A new touchscreen interface lets you easily switch between vessel-specific Smart Programs and manual options, all while standing up to everyday kitchen wear and tear. Blast through everything from ice to whole fruits in seconds for frozen drinks, ice cream, snow cones, and more. 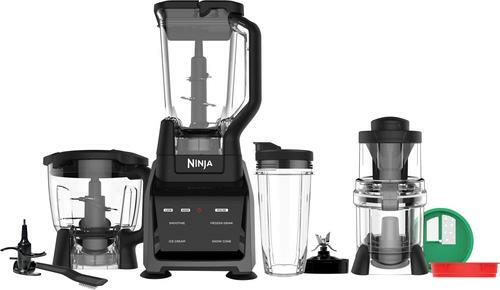 To meal prep and beyond—The Ninja food processor allows you to chop, puree, garnish, and even make dough. Make smoothies, juices, refreshers, and more. Top it off with included Spout Lid and you can also take it to go. Turn fruits and veggies into fresh noodles for light versions of comfort food classics. Change your vessel! Change your menu! Enjoy this Ninja Intelli-Sense Kitchen System Review! Cauliflower Fried Rice Recipe! Ninja Intelli-Sense Kitchen System Review! Place cauliflower into the 64-ounce Precision Processor. Transfer to a bowl; set aside. Place carrot and ginger into the 64-ounce Precision Processor. Add sesame oil to a medium saute´ pan over medium-high heat. Allow pan to heat for 1 minute, then add cauliflower and carrot/ginger mixture. Cook for 5 minutes or until cauliflower is tender, stirring occasionally. Add green onions, peas, soy sauce, and pepper. Cook for 2 minutes or until heated through. Salted Caramel Chip Cookies! Ninja Intelli-Sense Kitchen System Review! Position the Dough Blade Assembly in the 64-ounce Precision Processor, then add all ingredients, except caramel or toffee bits, in the order listed. Add caramel or toffee bits to the 64-ounce Precision Processor and select CHOP. Then carefully scrape down sides of bowl with spatula. Scoop dough by the tablespoonful onto prepared baking sheet 2 inches apart. Bake 8 to 10 minutes, or until light golden brown. Kiwi, Melon, and Coconut Ice Pops Recipe! Place all ingredients into the 24-ounce Slim High-Speed Blender Cup in the order listed. Remove blades from cup after blending. Pour mixture into ice pop molds, and freeze for 8 hours or overnight. Strawberry Banana Smoothie Recipe! Ninja Intelli-Sense Kitchen System Review! Place all ingredients into the 72-ounce Total Crushing Pitcher in the order listed. Beef Burger Sliders Recipe… Ninja Intelli-Sense Kitchen System Review! Place beef chuck, beef brisket, onion, salt and pepper into the 64-ounce Precision Processor. Select CHOP until ingredients are finely ground. Heat olive oil in a large skillet over medium-high heat. Form the meat mixture into 6 patties and place on the skillet. Cook for 5 to 6 minutes per side, or until desired doneness is reached. Serve burgers on buns, topped with cheddar cheese and barbecue sauce. Curry Chicken Salad Recipe! Ninja Intelli-Sense Kitchen System Review! Place all ingredients, except raisins, into the 64-ounce Precision Processor in the order listed. Select CHOP until desired consistency is reached. Top with golden raisins and serve. DO NOT BLEND HOT INGREDIENTS. Veggie Burgers Recipe! Ninja Intelli-Sense Kitchen System Review! Place onion and carrot into the 64-ounce Precision Processor. Select CHOP. Add 1/2 the white beans to Nutri Bowl. Select CHOP. Transfer onion mixture to a medium mixing bowl. Add remaining white beans, quinoa, egg, bread crumbs, salt, pepper, oregano, and paprika. Stir to combine. Divide mixture evenly and shape into 4 patties. Add canola oil to a large sauté pan over medium-high heat. When oil is hot, add patties. Cook 8 minutes, or until heated through, flipping halfway through cooking. Serve over a salad or on a toasted bun. Tangerine Protein Machine Recipe! Ninja Intelli-Sense Kitchen System Review! Gazpacho Recipe! Ninja Intelli-Sense Kitchen System Review! Add all ingredients, except tomato juice, into the 64-ounce Precision Processor in the order listed. Select CHOP. Add tomato juice and select LOW for 5 seconds, or until desired consistency is reached. NOTE: Always allow the soup to cool to room temperature before blending. Once blended, transfer mixture back to a saucepan and heat to desired temperature. Cherry Limeade Recipe! Ninja Intelli-Sense Kitchen System Review! Supreme Goddess Dressing Recipe! Ninja Intelli-Sense Kitchen System Review! Buffalo Chicken Burgers Recipe! Ninja Intelli-Sense Kitchen System Review! Place all burger ingredients, except olive oil, into the 64-ounce Precision Processor in the order listed. Select CHOP until ingredients are finely ground. Heat olive oil in a large skillet over medium-high heat. Form meat mixture into 4 patties and place them in the skillet. Cook 5 minutes per side, or until internal temperature reaches 165°F. Mini Cauliflower Pizzas Recipe! Ninja Intelli-Sense Kitchen System Review! Ingredients for Mini Cauliflower Pizzas.. Directions for Mini Cauliflower Pizzas..
Preheat oven to 350°F. Line a baking pan with a silicone baking mat or parchment paper and coat with cooking spray; set aside. Place cauliflower, 1/2 cup mozzarella, Parmesan cheese, eggs, and spices into the 64-ounce Precision Processor. Select CHOP until finely chopped. Transfer mixture to baking pan and divide into 4 portions. Spread and press mixture into 4 discs. Bake 30 to 35 minutes. Remove from oven and top with pizza sauce and remaining 1 cup mozzarella cheese. Bake an additional 5 minutes, or until cheese is bubbling. Sweet Potato Curly Fries Recipe! Ninja Intelli-Sense Kitchen System Review! Ingredients for Sweet Potato Curly Fries.. Directions for Sweet Potato Curly Fries..
Container: Auto-Spiralizer™ Blade Disc: Spaghetti..
Preheat oven to 400°F. Line a baking sheet with parchment paper and coat with cooking spray, then set aside. Place all Honey Mustard Sauce ingredients in a bowl and whisk until combined; set aside. Toss sweet potato noodles with oil, salt, and pepper. Evenly distribute on prepared baking sheet. Bake 40 to 45 minutes, tossing gently every 15 minutes, until golden brown. Serve with Honey Mustard Sauce. Smore Frozen Yogurt Recipe! Ninja Intelli-Sense Kitchen System Review! CONTAINER: 72-ounce Total Crushing® Pitcher..
Place all ingredients into the 72-ounce Total Crushing® Pitcher in the order listed. Remove ice cream from the Total Crushing® Pitcher and place in the freezer for at least 30 minutes before serving. Strawberry Snow Recipe! Ninja Intelli-Sense Kitchen System Review! Place all ingredients into the Total Crushing Pitcher. Zucchini Spaghetti with Basil Pesto Recipe! Ingredients For Zucchini Spaghetti with Basil Pesto.. Directions for Zucchini Spaghetti with Basil Pesto.. Position the Spaghetti Blade onto the Collecting Bowl and assemble Feed Chute Lid. Place zucchini into feed chute; secure on Blade Disc pin. Firmly secure pusher. Select GO; process zucchini. Remove zucchini noodles from Auto-Spiralizer and set aside. Repeat! To prepare pesto, remove Auto-Spiralizer from base; replace with Precision Processor Bowl. Place basil, garlic, pine nuts, Parmesan, salt, and pepper into the Precision Processor Bowl. PULSE until coarsely chopped. Add olive oil and select GO until smooth. Set aside. Heat 1 tablespoon olive oil in a 12-inch nonstick skillet over medium-high heat. Add zucchini noodles and cook 2 to 3 minutes, or until just tender, stirring gently. Add pesto, peas, and tomatoes and cook until just heated, about 1 minute. Garnish with fresh basil leaves. Salsa Fresca Recipe! Ninja Intelli-Sense Kitchen System Review! Place all ingredients into the 64-ounce Precision Processor in the order listed.Select DIPS. Place salsa into a dish and cover with plastic wrap. Refrigerate at least 1 hour before serving. Fresh Citrus Margarita Recipe! Ninja Intelli-Sense Kitchen System Review! Ingredients for Fresh Citrus Margarita.. Directions for fresh Citrus Margarita..
Margherita Pizza Recipe! Ninja Intelli-Sense Kitchen System Review!